The total amount of silver ever mined. The total amount of silver available in investment grade bullion form. The result of this supply analysis yields two different ratios for gold versus silver. Interestingly, gold has a very high stock-to-flow ratio compared with silver. Gold’s stock or total volume ever produced is roughly 170,000 tonnes, while its yearly production or flow was reported at 2,586 tonnes in 2010 by the World Gold Council. 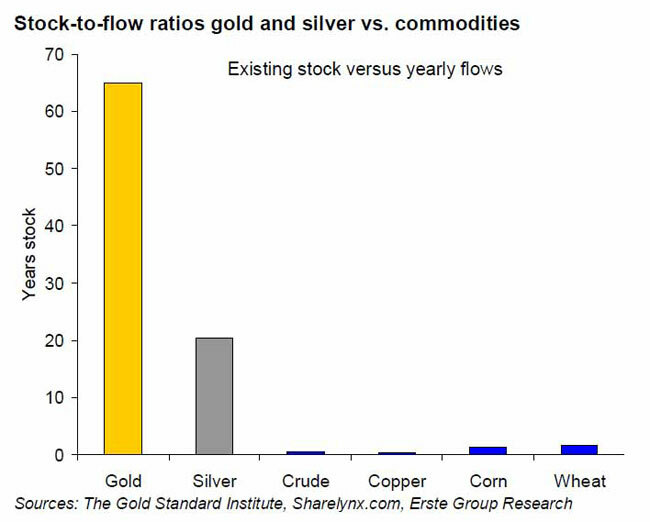 This puts gold’s stock to flow ratio at 65.7 years, while silver’s is less than one third of that. Other key commodities — like crude oil, copper, corn and wheat — have much lower ratios, as the following chart illustrates. It was not until the Industrial Revolution — and more specifically the 20th century — that silver became useful in a variety of products and processes in small and dispersed quantities that essentially consumes the metal. This is where gold and silver diverge, since gold is typically more easily reclaimed than silver. Basically, a substantial difference between silver and gold is that the various forms of above ground silver are typically more difficult to recycle and recover the silver from than it takes to recover gold from the products containing it. Silver is therefore often more easily mined and refined than recycled. Furthermore, for each of these precious metals, not only is a cost associated with mining each ounce, but there is also a shadow cost involved in recycling each ounce. From an industrial perspective, a trend toward ‘just in time’ delivery makes reliance on melting down Grandma’s silverware rather unlikely. In addition, reclaiming silver from industrial uses like photography, medicine and solar panels is also challenging. Deflationists typically cite the performance of the U.S. dollar during the Great Depression as evidence of the futility of money printing and the difficulty of creating enough inflation to spark real economic growth. The problem is that most ardent deflationists fail to consider that this time around - the U.S. Dollar has no precious metal backing it. Paper Dollars are only backed by faith and confidence in the creditworthiness of the debt-laden United States, and they offer no ultimate safety to holders. Trust in the current and future purchasing power of money — or any means of payment — not only depends on how much is available now, but also on how the quantity of money is expected to change over time. Furthermore, a form of money should have both a stable amount of annual production and a sufficiently large amount of stock to permit a typical volume of transactions to occur. Although gold may seem more like money than silver due to its higher stock to flow ratio, the prices of both hard currencies are heavily managed and manipulated. Once that management becomes untenable due to the pent up forces of market supply and demand, the true value of silver and gold will be revealed.